Why does Fargo flood? The Red River of the North, which forms the border between North Dakota and Minnesota, has a long history of severe floods. Major floods include those of 1826, 1897, 1950, 1997, and now 2009. The 1997 flood caused billions of dollars of damage, with greatest impact to the city of Grand Forks, north of and downstream from Fargo. The 2009 flood, which has primarily impacted Fargo, appears to have peaked early on March 28. Several factors combine to cause floods. Obviously, rainfall and snowmelt rates (and their geographic distribution) are the fundamental variables that create flooding in some years and not others. 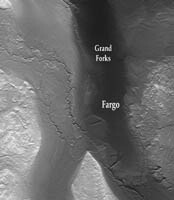 But the repetition of flooding in Fargo (and areas downstream), rather than in adjacent regions, can be attributed largely to its topographic setting and geologic history. The formation of landforms in the geologic past is often interpretable from digital topographic data, such as that supplied by the Shuttle Radar Topography Mission (SRTM). This image, covering parts of North Dakota, Minnesota, and South Dakota, displays ground elevation as brightness (higher is brighter) plus has simulated shading (with illumination from the north) to enhance topographic detail such as stream channels, ridges, and cliffs. The Red River of the North is the only major river that flows northward from the United States into Canada. In this scene it flows almost straight north from Fargo. North of this image it continues past the city of Winnipeg, Manitoba, and into Lake Winnipeg, which in turn drains to Hudson Bay. In the United States, the river lies in a trough that was shaped by continental glaciers that pushed south from Canada during the Pleistocene epoch, up to about 10,000 years ago. This trough is about 70 km (45 miles) wide and tens of meters (very generally about 100 feet) deep. Here near Fargo it lies on the east side of a much broader, topographically distinct pathway of former glaciation that narrows to about 190 km (120 miles) wide. South of Fargo this narrowed pathway splits into two distinct paths (broad dark swaths on the image) that were carved by the southward flowing glaciers. Arcuate glacial moraines (deposits of rocks that were carried by glaciers) can be seen near this split, near what is now the approximate boundary between the Hudson Bay and Gulf of Mexico drainage basins (the latter via the Mississippi River). This glacial landscape has features that were favorable for the transport of ice but are not now so favorable for the transport of water. As measured in the digital elevation data, the Red River decreases in elevation only 40 meters (130 feet) from Fargo to the Canadian border (top of image) over a straight-line distance of 235 kilometers (145 miles) along the glacial trough. This is a gradient of only 17 centimeters per kilometer (11 inches per mile), and the actual river gradient is much lower as it follows a longer curvilinear path. Areas surrounding the trough (more rugged and bright in the image) have variable but generally much steeper gradients. In simple terms, this is a fundamental cause of flooding in Fargo. The speed of drainage of the rainfall and snowmelt is greatly related to topographic slope. The steeper slopes and merging streams concentrate water runoff into the glacial trough at Fargo, while the lower gradients within the trough allow the water to spread (and flood) but not drain quickly away. Elevation data used in this image were acquired by the Shuttle Radar Topography Mission aboard the Space Shuttle Endeavour, launched on Feb. 11, 2000. The mission was a cooperative project between NASA, the National Geospatial-Intelligence Agency (NGA) of the U.S. Department of Defense, and the German and Italian space agencies, and was managed by NASA's Jet Propulsion Laboratory, Pasadena, California.